The eye is a marvellous piece of organic machinery. It captures nothing but photons of light, which are emitted and reflected by various objects around us. But with the help of our brain, it turns those fleeting electromagnetic imprints of the world into what we perceive as an image. From those ghostly images, our brain deduces with astonishing reliability facts and details about everything in the world around us. Objects that are nearby are located so precisely in three dimensions by our visual system that we can extend a hand and pick them up, without being a millimetre or two off in our grasp and fumbling them. We can see objects kilometres away and know what is happening at such great distances. We can judge the trajectory of a ball thrown at high speed from dozens of metres away so accurately that we can catch it, or hit it with a bat. These are marvellous and amazing feats of perception, coordination, and dexterity. All enabled by our eyes. But the eye is complex and delicate. It is relatively easy for damage of various kinds to occur to it. You can damage your eyes by looking at an object 150 million kilometres away - our sun. The intense light of the sun is so bright that, when focused by our eyes' lenses onto the retina, it burns the cells there. Physical trauma can damage the eyes quite easily, and they can fall prey to various infections. Like the rest of our bodies, our eyes also age and become less reliable over time. The lenses lose their flexibility, and with that goes our ability to focus on nearby objects, which is why so many older people need reading glasses. Another age-related problem is macular degeneration, in which the macula, the region of the retina forming the centre of our field of vision, suffers a loss of the light-sensitive rod and cone cells. This is caused by atrophication of the underlying retinal pigment epithelium layer, which supplies nutrients to the cells. Macular degeneration is a serious condition which causes loss of vision in the centre of the visual field, making it difficult to do things requiring fine visual acuity, such as reading or recognising faces. Even worse, there's no effective treatment. The symptoms of macular degeneration are easy to see (pun intended) with a simple diagnostic test that anyone can do themselves. 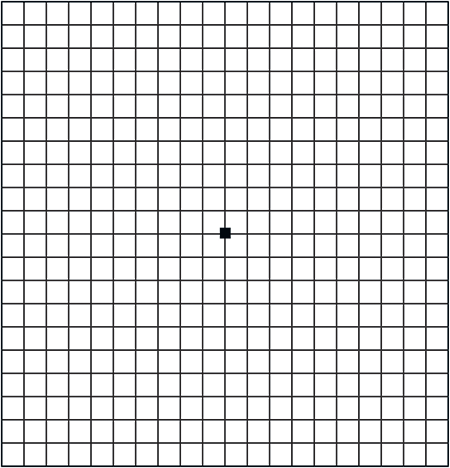 The test uses an Amsler grid, which is just a grid of straight black lines printed on a sheet of paper (or perhaps displayed on a screen), with a dot in the middle (see the Figure). 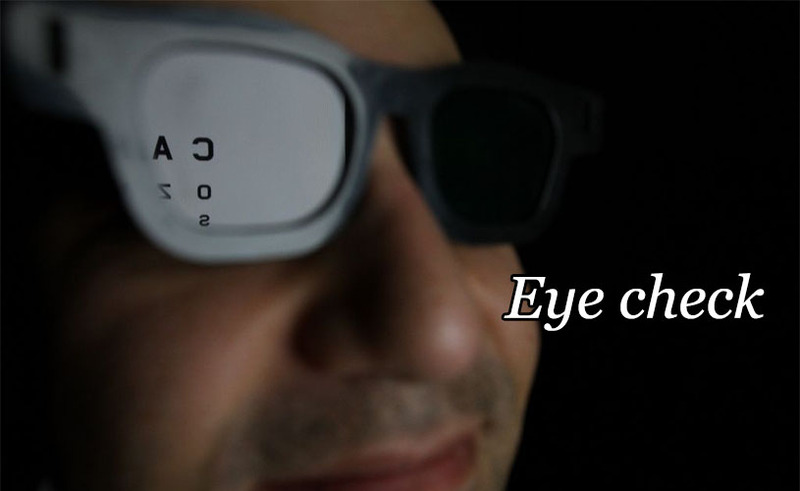 Placing the grid at a normal reading distance, you cover one eye and focus on the dot with the other eye. With normal vision, the grid looks like... a grid. Exactly what you'd expect. 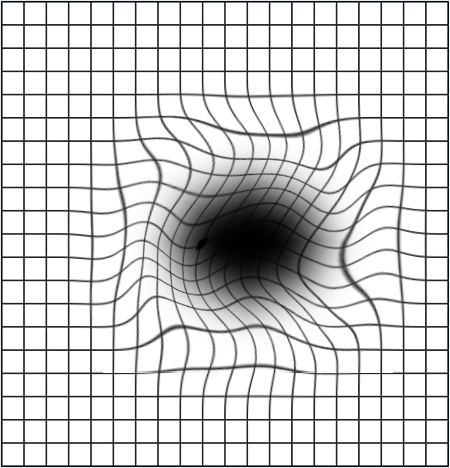 If the eye being tested has macular degeneration, the grid looks distorted. Some lines will no longer appear straight, and there may be regions of the grid which are not visible, appearing as dark blotches. 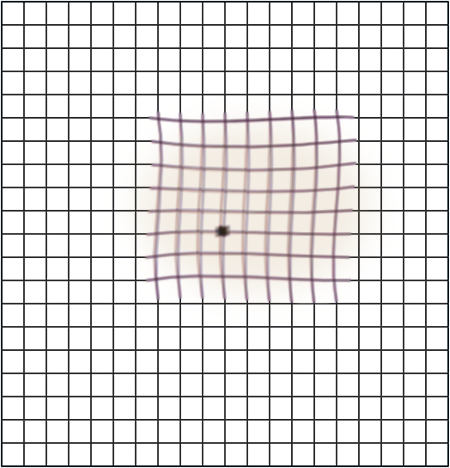 Simulated appearance of Amsler grid as viewed by an eye with macular degeneration. This symptom is caused by the effects of the degeneration on the macula. Loss of light-sensitive cells causes the dark blotches, and physical distortion of the retinal surface causes distortion of the image. It's like trying to take a photo with (old fashioned) film, where the film has had a hole burnt into it and is all wrinkled around the edges, instead of being stretched flat. With central serous retinopathy, the rod and cone cells are undamaged, but they are pushed away from their usual place snug against the epithelium. This is like buckling the film in a camera, and causes the image formed on the retina to be blurry and distorted. And because it occurs in the macula, this blurriness tends to be right in the middle of one's field of view, right at the spot you are looking at and paying the most attention to. There is no treatment for central serous retinopathy but, fortunately, the prognosis is generally good. The fluid forming the blister is slowly reabsorbed and the retina returns to normal. This process typically takes three to six months, though. A week ago, on Saturday, I sat down to watch something on a DVD. My DVD player has an LED display indicating the elapsed time of the program, which I occasionally glance at during a movie to see roughly how much time is left. Normally I can read this easily from my seat across the room. On this Saturday, I couldn't. The display was blurry in my vision. No matter how I squinted, I simply could not make out the digits. Simulated appearance of Amsler grid as viewed by my left eye during my recent ophthalmologist examination. On Monday I went to an optometrist and explained what had happened. She took fundus photographs of my retinas, comparing them to reference photos I had taken a couple of years ago at my last eye exam. She showed me an Amsler chart. With my right eye the grid looked fine. With my left eye, I was shocked to see the lines distorted, blurry, fringed with blue and red colours, and the whole chart somewhat darkened in the middle region. I have created a simulated version of what I saw, shown in the Figure. She suggested I probably had central serous retinopathy and referred me to an ophthalmologist. Two days later, the ophthalmologist examined my eyes and took optical coherence tomography images of my retinas (see Figure). He confirmed the diagnosis and gave me further information about the condition. There is no treatment, and I am to return in four months so he can monitor progress. Nobody has yet worked out the underlying cause of central serous retinopathy. It mostly affects males of about my age, and nearly all of them recover without intervention and have no recurrence of the condition. So I'm very positive and looking forward to recovering fully. Optical coherence tomography image of my left retina. Optical coherence tomography image of a normal retina. Creative Commons Attribution image by medOCT-group, Dept of Med. Physics, Med. Univ. Vienna, from Wikimedia Commons. The OCT figure shows a cross-section of my left retina, with an image of a normal human retina below. The scan of my retina is 6 millimetres long. The fovea is the central region of the macula, where the layers of tissue overlying the light-sensitive rod and cone cells thins out, giving the greatest visual sensitivity and acuity. The rod and cone cells sit in the dark band, just above the red layer which is the retinal epithelium. They normally lie in a flat band, like a nice flat piece of film, ready to sense the images of the world which are formed by the eye's lens. As you can see, in my left eye this layer is blistered and buckled. Right where the fovea is. The "film" layer in my left retina is wrinkled, and the image that forms there is now distorted and out of focus. There is also some discolouration in the image I see, with sharp lines separating into red and blue ghost images that are not quite aligned, and an overall browny yellow darkening of the central region of my vision. This change in my vision is most noticeable when I am reading, as that relies on the sharpness of my central vision. My right eye happens to be fairly shortsighted, and I normally rely mostly on my left eye for vision, so the overall effect is worse for me than if my right eye had good vision. That said, it's not too bad. I can still read books and computer screens, but it gets a bit annoying and straining on my eyes after a while. My reading of more distant objects is more seriously affected - I've lost two or three lines of reading ability on a standard eye test chart. I'm glad my condition is not worse, and that the prognosis is positive. However, I suspect that my ability to read and work at a computer will suffer over the next few months. I plan to take more frequent and longer breaks from such activity, to minimise eye strain. This means that these Sunday annotations will become significantly shorter for the next few months. I plan to continue writing them, but will devote less time to them. I know many of you will want to wish me a speedy and complete recovery. If you choose to send me a message, please understand that I am unlikely to reply to everyone, but that your good wishes are much appreciated. I debated whether or not to share this news publicly. I know other people with some Internet following have chosen to be very private about any medical conditions they deal with. I chose to share because I think learning about this sort of stuff is fascinating, and I hope that I can share some of that knowledge with you. In the big picture of things, central serous retinopathy is a fairly minor condition, and I don't want to make a big drama out of it. Other people deal with much more serious things every day, and I don't want to trivialise any of those. In particular, macular degeneration is a much more serious eye condition. If any of you reading this have tried the Amsler grid test and noticed something odd in one or both of your eyes, please consult an eye care specialist for a proper diagnosis. Last Modified: Sunday, 12 January 2014; 02:10:45 PST.